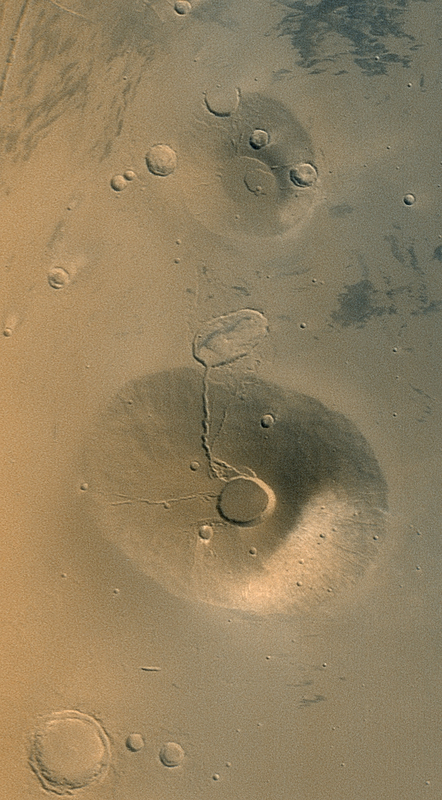 Acquired in March 2002, this Mars Global Surveyor (MGS) Mars Orbiter Camera (MOC) wide angle view shows the martian volcanoes, Ceraunius Tholus (lower) and Uranius Tholus (upper). The presence of impact craters on these volcanoes, particularly on Uranius Tholus; indicates that they are quite ancient and are not active today. The light-toned area on the southeastern face (toward lower right) of Ceraunius Tholus is a remnant of a once more extensive deposit of dust from the global dust storm events that occurred in 2001. The crater at the summit of Ceraunius Tholus is about 25 km (15.5 mi) across. Sunlight illuminates the scene from the lower left.